Do the English really have bad teeth? 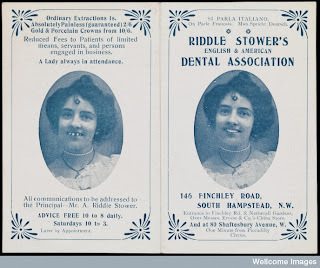 While looking for interesting items from our collections to show a visiting group of dental professionals, I came across these examples of dentists’ advertising cards in our Ephemera Collection. 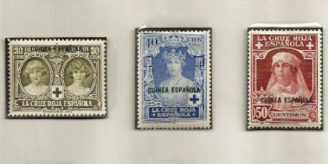 All dating from around the early 1900s, they demonstrate an intriguing persistence in design. A young woman is depicted in ‘before and after’ shots in which her blackened teeth are transformed into a perfect smile. In two of the cards the pictures are helpfully labelled to reassure you that the dentist will restore you smile, not leave you toothless. The design becomes faintly ridiculous when it is applied to a photograph where the blackened teeth are obviously faked. 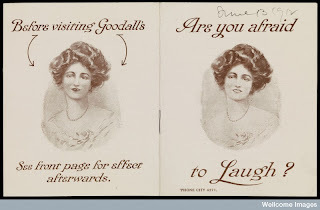 Apart from the glimpse of advertising in its unsophisticated infancy, the cards also offer an interesting comment on the fashion of the time. The hair, jewellery and dress of the young women is virtually identical in all three cards, and one wonders if they might have been modelled on some famous beauty of the time? The British public seem generally left far and away behind other countries and especially America as regards [dentistry]. 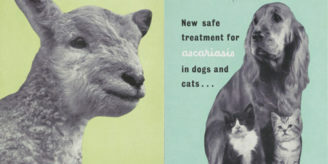 The present uphill struggle is due to the antagonism of old-fashioned English dentists who are content with the old systems laid down by their fathers and probably their grandfathers. I warn patients against all so-called American dentists whose qualifications will not bear the light of day. It was possible some years ago for Englishmen to obtain a sham degree from America for the large sum of $10… styling themselves ‘American dentists’. It’s fascinating how ideas persist in societies, long after the original circumstances have disappeared or been forgotten. 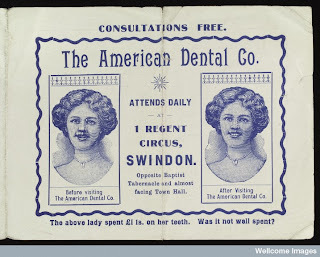 It would seem that those jokes in American films and TV programmes about the English having bad teeth might have had some basis in truth, at least at the end of the nineteenth century when American Dentistry became mark of high quality, even amongst the English.